The winter storm hitting us right now is a reminder of how coastal flooding and winter storms can mix and bring a dangerous combination of hazards. While the winds in this storm are substantially weaker (good news) than the Blizzard of ’78, both storms hit during extreme spring tides. 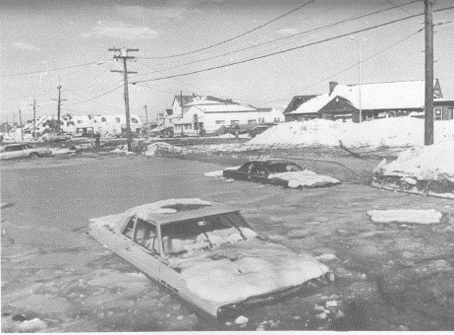 The 1978 storm was the worst flood event on record for places like Boston. 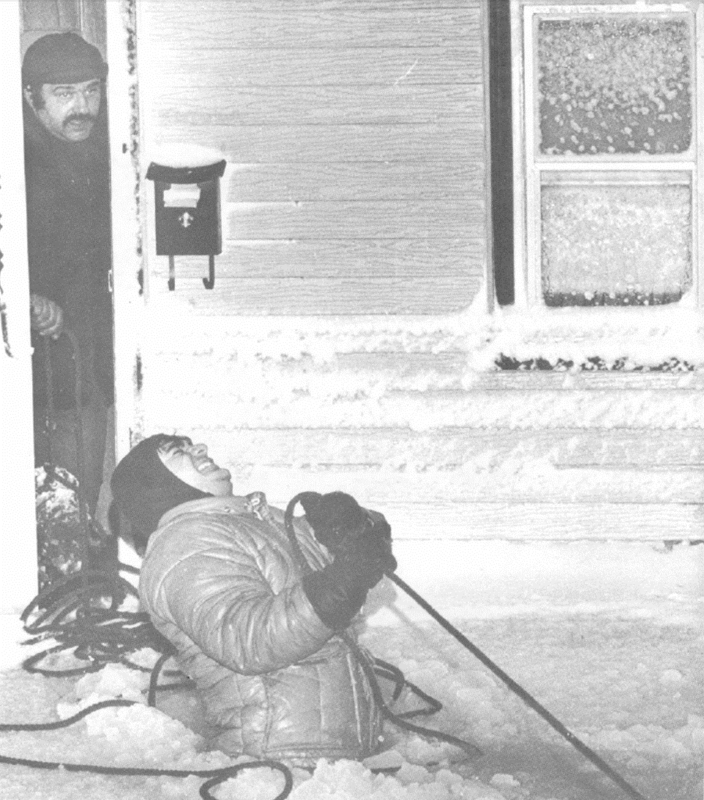 The Blizzard of ’78 caused record flood levels and also multiple feet of snow. Combined with freezing temperatures this led to a very dangerous disabling of coastal communities in the Gulf of Maine and Massachusetts Bay. this home in Revere, Mass (photograph by Paul Benoit, Boston Herald American). The storm surge forecasts at New York City, Long Island Sound, and the New Jersey Shore for this evening’s storm are only calling for about 2 feet of storm surge, but it is coming on top of some of the year’s highest tides. We do not provide forecasts for Boston, but our forecasts for The Battery and Kings Point, in the NYC region, suggest only a 1.5 foot and 2.0 foot surges, respectively. NOAA’s two models predict a ~2.5 foot surge and ~3 foot surge at these same locations. Stevens NYHOPS Storm Surge Warning System forecast for water levels at Kings Point (magenta), relative to mean lower low water (MLLW – normal daily low tide). Predicted tides are also shown (blue), as well as observed water levels (red) and two NOAA ET-Surge forecasts for comparison (green). 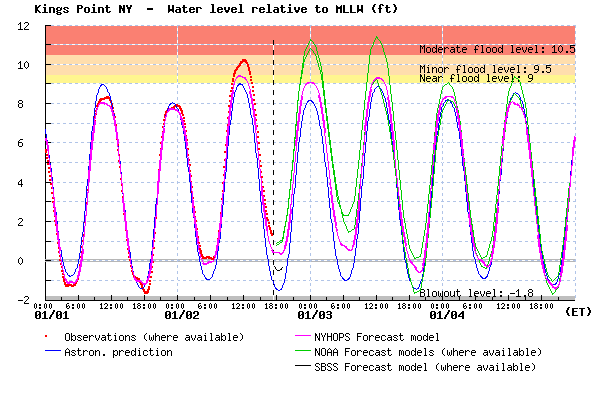 Above is the figure showing the astronomical tides, as well as several forecasts for water level, suggesting that moderate flooding (barely over seawalls in a few places) may occur in Long Island Sound. Flood levels in the direst forecasts at the moment are more than 6 feet lower than those seen during Sandy for The Battery and ~3 feet lower at Kings Point, Long Island Sound. Check for yourself as the storm proceeds, using the Storm Surge Warning System. This entry was posted in security, Uncategorized, water and tagged 1978, blizzard, Boston, flood, forecast, freeze, frozen, ice, storm, storm surge, storm tide, water level, winter. Bookmark the permalink.